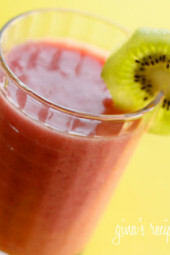 This simple low calorie smoothie combines exotic kiwis with strawberries and yogurt. A delicious combination and a great high fiber breakfast on the go, loaded with vitamin C! OMG! Sounds soooo good! Going to try it this afternoon. 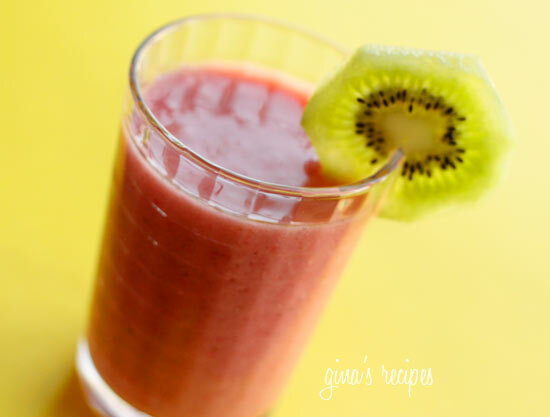 Love strawberry + kiwi together especially in smoothies! What a great looking smoothie! I HAVE to had a frozen banana in my smoothies! 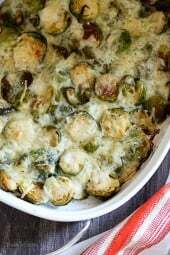 I subbed greek yogurt because it is what I had, this recipe is delicious. The hubby liked it too! I was making this smoothie for myself and decided to try and make a batch for the kids. I substituted the yogurt for greek yogurt since that's all I had on hand. The kids love them and they are so much better for them then those Danimals smoothies. Thanks for all the great recipes! If you don't peel the kiwi you will get a lot more antioxidants and triple the fiber! It is completely edible! Delish! Thanks have had this the last couple of days for breakfast with a english muffin. LOVE SMOOTHIE WEEK!!!! THANKS BUNCHES! Love the idea of freezing them! Great idea for the summer! I tried this yesterday and it was really good. Will be having the other one serving today for snack. I froze it. Yum! 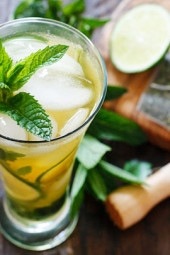 So delicious fora hot summers day! Good Point! I just recalculated the points and I got zero for one serving. But if I check the points for both servings, it's 2 points because you can only count up to 4 grams of fiber. This is probably the most confusing part of the ww points for me. So technically if you drink 1 serving, it's 0 points! Love your blog! But, would it even be 1 pt? The Fiber One yogurts figure to be 0 points because of the high fiber. Even better for us Weight Watchers! I love your blog and I try to visit as often as I can and share too. @A Wedding Story – So delish for only One point! Thanks for sharing with your WW meeting! I just came across you blog yesterday! LOVE IT! 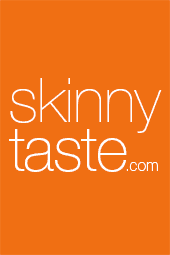 I have forwarded it to all my friends and will be sharing this site at my weight watchers meeting tomorrow! THANK YOU GINA!!! I just made this smoothie this morning and it is really yummy. And just one point! WOW! Yes, one 4 oz yogurt! I love the idea of freezing these! These would make excellent 1 pt popsicles! I make smoothies ALL the time! I pour the extra servings into popsicle molds, freeze, and then I have a fun snack for another day! BTW, I found your blog last week and I think it is AWESOME!!! How many ounces of yogurt did you use? One of the little cups of the Fiber One yogurt? Thanks for all the great recipes. My family doesn't even know they're Weight Watchers! I have a smoothie recipe up on my blog too:) I love them! I will have to try this one next time!